You know how it is on Black Friday. The weather? Just as bad. And the competition for the biggest items on the wish list? Intense. 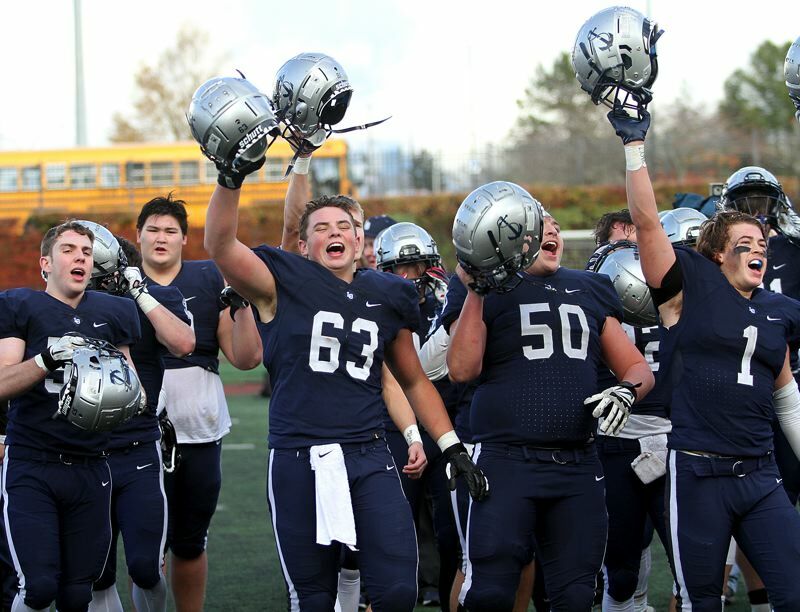 Despite all that, the Lake Oswego football team got just what it wanted, beating Jesuit 24-14 in Friday's Class 6A state semifinals at Hillsboro Stadium. "It feels great," said Lake Oswego junior wide receiver Thomas Dukart, who finished with four catches for 42 yards and his team's first touchdown. "Last year, we lost in the semifinals which was a heartbreaker, but now that we've made it and all the work has paid off, we're excited." "It feels amazing, I feel like we're on top of the world," said senior running back Keenan DeRaeve, who carried eight times for 29 yards in the win. With the win — the Lakers' ninth straight — Lake Oswego improved to 12-1 overall and won a berth in next week's Class 6A state championship game. The top-ranked Lakers will face either No. 2 Clackamas (12-0 overall) or No. 3 Sheldon (10-2 overall) at 12:30 p.m. Dec. 1 at Hillsboro Stadium. "All I care about is winning a championship," said Lake Oswego senior linebacker Mike Mercep, who finished with five tackles, including 3.5 sacks. "It just comes down to game-planning. We'll be ready." "You've just got to trust each other, trust the coaches — it's what we've been doing through our four years here at Lake Oswego," said Lake Oswego senior defensive back Matt Sebolsky, who made five tackles in the game and also intercepted a Jesuit pass. "This is the dream right here." Fourth-ranked Metro League champion Jesuit, meanwhile, saw its 10-game winning streak snapped and finished its 2018 campaign at 11-2 — with both losses coming to Lake Oswego. "At the end of the day, we just didn't give it our all," Jesuit junior fullback Logan Horton said. "There were a couple of mental mistakes made by us, but it is what it is. We're Jesuit football. We're going to do what we do next year and the year after that and 20 years down the road. I love being a part of this program." "It came down to discipline and how we needed to perform our jobs," Jesuit senior linebacker Zach Carr said. "We had a lot of flags, a lot of drive-killing penalties. We weren't as disciplined as we normally are or as we should be. It wasn't them, I think it was us that needed to step up and unfortunately we didn't." Despite the final outcome, it was Jesuit that struck first on Friday. Following a 37-yard kick return by Kade Wisher, the Crusaders scored in just six plays, getting an 18-yard completion from Will Spitznagel to Colin McMahon, and later, a 2-yard touchdown dive by Andy Alfieri for a 7-0 lead just 1 minute, 44 seconds into the game. "People didn't expect us to make it this far at all," Carr said. "We had a bunch of dudes who had never even played a varsity snap before and they stepped up. We had a different level of chemistry. The guys just wanted it more than other years. We earned everything. Nothing was given to us." The Lakers answered with their first score on the ensuing drive, marching 80 yards in eight plays, a drive highlighted by quarterback Jackson Laurent's 54-yard completion to Casey Filkins that took the ball to the Jesuit 25. Six plays later, Laurent hit Dukart on the right side for a sliding catch and a 7-yard TD that tied the game at 7-7. After a Lake Oswego stop that included a sack of Spitznagel by LO's Marshall McGuire, the Lakers took their first lead of the game at the end of another 80-yard drive. Collin Bracken got things started with two carries for 21 yards, and three plays later, Laurent threw down the right seam toward wide receiver Jack O'Brien. Jesuit's Gary Hollands went up to make what looked like it would be an interception, but tipped the ball downfield into O'Brien's hands for a 46-yard score and a 14-7 lead with 22 seconds left in the first quarter. "God was working with both teams but gave (Lake Oswego) a couple of love points today," Horton said with a smile. "(Lake Oswego) has a bunch of great competitors. I love playing against them, but man, they had a couple of lucky plays. And we gave up a couple of big plays which was a bummer. It hurts a little bit, but we'll be back bigger, faster, stronger and ready to roll next year." The Jesuit defense stiffened there, however, and kept Lake Oswego off the scoreboard for the next 20:42, giving the Crusader offense a chance to get their team back into the game. That's just what Jesuit did, too, marching 74 yards on its next series to forge a 14-14 tie. Spitznagel caught a pass from teammate Josh Daul for 25 yards on that drive, and three plays later, Spitznagel returned the favor, finding Daul down the right side for a 34-yard touchdown with 9:16 to go in the half. "I've never been a part of a team that's so close and loves each other like this team did," Horton said. "I think when you take a group of guys that work so hard together, bleed together, get hurt together, support each other, it really brings you close as a family and it's what made this team a family for me. I'll never forget these guys." Neither team would score again in the half, with Lake Oswego managing just one first down the rest of the way while Jesuit saw its best opportunity stopped when LO's Chris Todd sacked Spitznagel near midfield to force a punt. In the second half, it was the Lake Oswego defense's turn to step up. The Lakers got interceptions on each of Jesuit's first two possessions in the third quarter — by Joe Hutson and Sebolsky — and made the Crusaders pay for the second one. After Sebolsky's pick gave Lake Oswego possession at the Jesuit 42, the Lakers needed just five plays to score, getting 15 yards on two carries by Bracken, then a 7-yard TD run by Filkins out of the Wildcat formation to push ahead 21-14 with 3:40 remaining in the third period. The Laker defense came up with another stop on Jesuit's next series — aided by a Crusader penalty that wiped out a 34-yard pass play — and LO took over at the start of the fourth quarter. From there, Lake Oswego stitched together a 15-play drive that covered 72 yards, took 8:13 off the clock and culminated when kicker Diyar Dezay drilled a 31-yard field goal that boosted the Lakers' lead to 24-14 with just 3:47 left to play. From there, the LO defense did the rest, getting a fourth-down sack of Spitznagel by Malcolm Williams to stop one drive, then seeing Mercep sack Spitznagel three times on Jesuit's final possession to end the game. "The key was us just quitting making mistakes," said Lake Oswego senior linebacker Gabe DeVille, who led the LO defense with 14 tackles. "In the first half, we felt like we were killing ourselves with penalties and false starts and holding so we just got down in the second half and played like we're used to playing." "We've got … all these leaders," Mercep said. "They came out and said 'We've got to stop them here' and we did. It was our competitiveness. We brought it." For the game, Filkins carried eight times for 58 yards and one TD, and caught six passes for 95 more. Bracken added 52 yards on the ground on 10 caries. Laurent was 16 of 27 for 246 yards and two touchdowns. For Jesuit, Wisher ran 13 times for 80 yards, Spitznagel went 9 of 19 passing for 129 yards and one TD with two interceptions, and Daul made four catches for 64 yards. On defense, Gary Hollands led the Crusaders with eight tackles and Carr had seven. Matt Singledecker contributed to this story.